This article highlights the inadequacies of the federal frameworks and market mechanisms that inhibit Australia from forming clear policy on emission reductions in the power generation sector. This article makes comparative analysis between the National Energy Guarantee (NEG) and other emission reduction schemes and legislation to review whether the proposed NEG mechanism is adequate to provide significant emission reductions. Regardless of the NEG policy status, this article digs deeper to understand the key regulatory frameworks and market mechanisms within the power generation industry that need to be addressed if the NEG or any policy is to succeed in providing sustainable emission reductions for Australia. This article will enquire into the new and evolving area of law surrounding arborist reports and determine the elements of a negligence claim that would need to be satisfied, in order for a consulting arborist to be found liable for negligence. Following an extensive review of the Victorian Environment Protection Authority, the Victorian Parliament passed the Environment Protection Amendment Act 2018 (Vic) which introduced a general environmental duty to minimise harm to the environment. General duties, a form of principle-based regulation, have been used in other areas of law with various degrees of success. For a regulator, implementing a regulatory regime in which a general duty plays a central role poses a number of challenges including how to provide organisational leadership, communicate the obligations imposed on duty holders and staff, educate duty holders how to interpret standards, identify and manage risks and achieve compliance, determine the relationship between a general duty and other statutory measures, provide a sound scientific basis for the law and enforcement, detect and enforce breaches of the law and evaluate its effectiveness. This article examines the challenges faced by the EPA as it prepares for the transition from a retrospective and reactive approach to one which is generally regarded as proactive and preventative. Victorian State forest harvesting regulation is given close scrutiny in its capacity to deliver ecologically sustainable forest management (ESFM). This article examines the current regulation controlling Victorian State forest harvesting from a sustainability perspective. It examines it from four perspectives: (1) balance of the elements of ecological sustainable development, (2) governance, (3) monitoring and measurement, and (4) compliance. Each are examined critically to determine efficacy in progress to the ESFM objective. Using criteria and indicators for sustainability as guidance in examining current regulation, the author provides support for a new regulatory model utilising adaptive/responsive regulatory structures. Emissions reductions in sectors outside of the European Union (EU) Emissions Trading System, such as transport and agriculture, land use and forestry are central elements in the European Union’s commitments under the Paris Agreement. In December 2017, EU member states and the European Parliament reached a final agreement on the Effort Sharing and Land Use, Land-use Change and Forestry Regulations for the period 2021–2030. The final agreement includes a number of new flexibility instruments to enable member states to reach their binding emissions reductions targets despite the fact that many EU member states will require little additional measures to meet their 2030 targets. The negotiations provide important policy lessons on the complexity of EU decision-making processes and reporting systems which will be important in future revisions of the legislation. 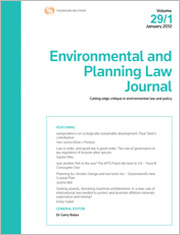 For the PDF version of the table of contents, click here: EPLJ Vol 36 No 1 Contents.